One of the more popular Double IPAs on the market today, Avery's The Maharaja was a major score when it landed in the Texas market a few years back. Produced from March through August, The Maharaja is part of Avery's Dictator Series of imperial-style brews, along with The Kaiser and The Czar. With hops and malts as his servants, he rules both with a heavy hand. The Maharaja flaunts his authority over a deranged amount of hops: tangy, vibrant and pungent along with an insane amount of malted barley - fashioning a dark amber hue and exquisite malt essence. Sounds good to me, let's venture into this kingdom, shall we? Appearance: A nearly clear orange-amber body with lots of sediment in solution. On top, a generous ivory-colored head that endures until the end of the glass, leaving excellent lacing (especially given the high alcohol content). Aroma: There's certainly no mistaking this for anything but a Double IPA. Up front, a massive wave of potent Northwestern hops with the classic floral, piney, and citrusy characteristics. Underneath, a solid caramel malt base and plenty of booze. Taste: Wow, this is big. Once again, the hops lead the charge and exhibit brilliant piney, resiny, and citrusy (mostly grapefruit) flavors. It's not a total hop-bomb blowout though, as the biscuity caramel malt backbone and brawny alcohol content are able to keep everything relatively balanced. While it's certainly a bitter beer, and I don't doubt the over 100 IBU rating for a second, the bitterness can be deceptively mellow at times. The aftertaste is strong and dominated by bitter, grapefruity hop flavors. Mouthfeel: Medium-full bodied with moderate carbonation and a dry finish. You can certainly feel the booze in the mouth and throat, but they are pleasant sensations. The resiny hops tend to coat the mouth, giving the bitter aftertaste lots of life. Drinkability: With a massive flavor profile, over ten percent alcohol content, and a full body, this is certainly a "sip-and-contemplate" beer. That being said, I had no trouble whatsoever devouring all 22 ounces in one sitting. 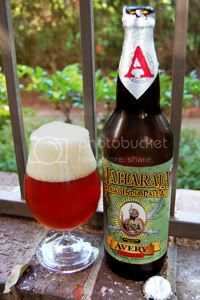 Verdict: As I had expected, with over 100 IBUs and 10% alcohol content, Maharaja is a massive beer. This is your typical big, untamed, unleashed Double IPA with a massive hop character, but a solid enough malt backbone to keep everything in check. This is only the second Avery beer I've tried, but I have to say I'm thoroughly impressed so far.